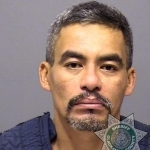 PORTLAND – U.S. Immigration and Customs Enforcement reports it had issued a civil detainer order for Martin Gallo-Gallardo, while he was being held on domestic violence charges in March. The suspect, who is an illegal immigrant, was released from jail when his wife and daughter refused to testify against him. Now, he’s back in jail for killing his wife last month. ICE issued the statement about the retainer to highlight that if it had been obeyed, Gallo-Gallardo would not have been able to kill his wife. Multnomah County Sheriff’s Sgt. Brandon White says ICE knows the process, and needed to issue an arrest warrant. “We are unable to hold individuals in custody based only on a civil detainer,” White said. That’s because of Oregon’s sanctuary status law. White says immigration officials should have known that. White says ICE had Gallo-Gallardo’s home address and telephone number and could have sent agents to pick him up and take him into custody.